During the entire experience lasting some 45 seconds or a bit longer, my wife kept repeating “Oh my God!” over and over again. One Friday evening, I was using a long pole with an attached brush designed to sweep the walls of the pool. Our children would probably swim early the following morning and I wanted the pool to be clean. As I reached upwards on the pole to push downwards I saw a craft approaching. The craft was at a distance equivalent one or two short blocks away and not flying parallel to streets but at an angle on a southeastern direction. It was immediately obvious to me that the craft was not a helicopter nor airplane since these would not normally fly that low and the physical characteristics did not match these. At that distance the craft seemed wider, with luminous lights in the circumference area of the frontal section (referred to as leading edge). I stared at it for a brief perplexed moment. After realizing that it was something out of the ordinary, I ran down the steps from the poolside deck platform where I had been standing. The platform was about four to five feet higher than the pool water and the opposite surrounding pool deck area. It was about 15 fast running steps from there to the backyard entry to the family room. My wife and two children were watching television there. I yelled for them to come outside and see, but only my wife Gloria came out. We both walked fast towards the side of the pool opposite the platform side where I had been standing. 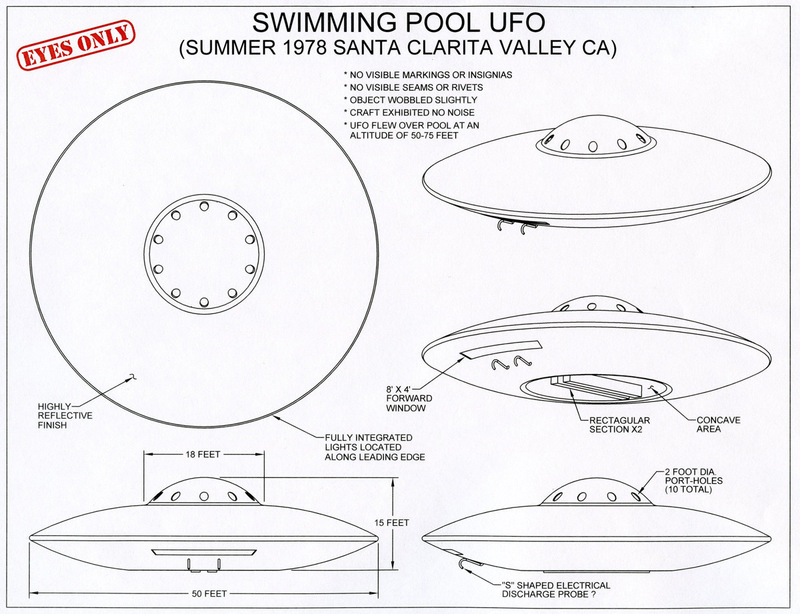 By that time the craft was right over our pool area at an altitude of no more than 50-75 feet and perhaps even less. 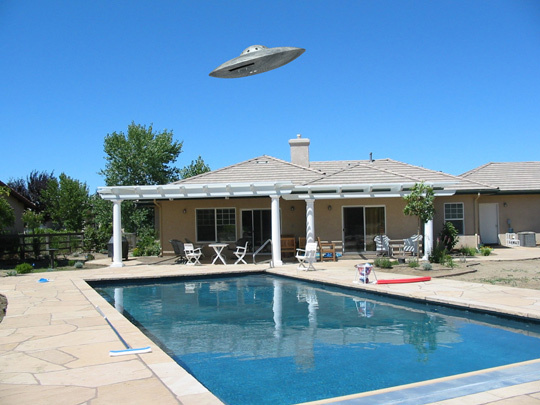 The craft had come to a stop in proximity to our pool area as we stood bellow it. The craft made no sound whatsoever. It wobbled slightly as if it were moved by the wind, but there was no noticeable wind at that moment. The craft leaned forward and downwards and then we saw a large forward angled window, located bellow the leading edge that was perhaps 8 feet in length and 3-4 feet in height. We could see an orange bluish glow from inside but no occupants or controls. As the craft leaned forward I could see light emanating from its upper section and not from the pool lights reflection since the pool lights would be unable to reflect on the upper section. The craft seemed to be manufactured as one solid piece. There were no visible seams or rivets. The bottom of the craft was concave towards the center. In the deepest section of the concave center two rectangular objects were visible, which ran the length of the deep concaved section and seemed to be a few feet apart from each other. The craft had an upper dome with porthole like windows but no internal visibility. The upper dome was round and centered in relation to the lower part of the craft with no visible seams. The total height of the craft appeared to be the equivalent of a one and half story typical track residence or less. I calculated the height by comparing it to our two-story house. The diameter was approximately 50-75 feet or less. There were no visible markings, insignias or identification on the craft. Under the front leading edge of the circular craft was some ski like devices with two side-by-side configurations. The design I cannot replicate even though I always scored high in I.Q, tests where design progressions (similar to mathematical progressions) had to be decided from multiple drawing choices. I also remember thinking they were too far forward from the crafts center of gravity something we studied in Group Propulsion in relation to the length and loading of aircraft. The ski-like devices were similar to the letter “S” with the top of the S facing forward but with more elaborate details filling the gaps. At the time my conclusion was they were some type of hanging or anchoring device. During the entire experience lasting some 45 seconds or a bit longer, my wife kept repeating “Oh my God!” over and over again. I tried to concentrate on details and in my mind kept repeating “take me with you.” We were both frozen in awe and disbelief. It was like seeing a large bus that I previously described as a Greyhound bus floating over your house. Both of us looked upwards and did not speak to each other during the sighting. There was no fear, an unprompted paralysis, and a high respect to what we were seeing. We both had the sensation of being watched primarily because the craft maneuvered downwards at an angle towards us, and then regained a level position parallel to the ground. As a part of my analysis during the experience I listened for other engines, other craft, or the possibility that this craft was being suspended from another craft as a hoax but concluded there were no other man-made craft in the vicinity. The craft then began to move at a very slow speed of around 20 miles per hour. I jumped on a wall that surrounded our backyard so that I could see the trajectory. I saw it between houses as it continued at that speed for at least 7 miles from our house, and heading in a southeast direction from Santa Clarita over a mountainous section of eastward Los Angeles County. I instructed my wife not to discuss it but to try to draw what she saw and then we would compare drawings. My drawings had more details. Then we began comparing the experience and both had seen the very same details. My conclusion is that the craft wanted us to observe it or perhaps was examining us. I am 100% sure this was not a man-made craft or technology. I am also convinced by the event that U.S. Government intelligence agencies know we are being visited by extra-terrestrials and are hiding facts. To me, the only rationale reason is because they lied once about their existence (perhaps Roswell and others) and the complex structured secretive system is not able to reverse course, or that disclosure may cause the loss of statutory governmental powers as citizens realize that borders, religions and global federal governments are meaningless and helpless. My conclusion leads me to think that the visitors do not wish to work with a single government as they are roaming global skies making their presence known. There were lingering questions in my mind after the sighting. Since the craft must originate from an advanced civilization why do they need windows? My technical assumption is that an advanced civilization would have cameras on the exterior which are able to duplicate exactly what is visible outside of the craft. Why were we allowed to see the interior through the large window but not the occupants? After reporting the experience to the local Sheriff, he said they had no additional reports. Years later after writing the experience on the internet, someone who claimed he was with NASA automated airport sciences called me and said that his call was unofficial. The only somewhat related experience was during a father daughter overnight camping event. The event was prior to our sighting experience. Several of my neighbors were FBI agents. During the outing two of the agents who had daughters were standing close to each other looking at the visible stars. One of them whispered to the other that he heard that strange crafts were often visible in the area. I was standing a few feet away from them and could hear them. During my earlier education, I graduated and was certified in Group Propulsion Systems and had a choice to either continue studies as a Flight Engineer or Aeronautical Engineering. I selected Aeronautical Engineering and attended Northrop Institute of Technology. In Group Propulsion Systems we became highly familiar with aircraft, mechanical and electrical systems and all flight disciplines, flight and design configurations and propulsion sciences. I am still more familiar with aircraft functions than an automobile. After two years of study I switched to business management at another university, was an early participant in IT as a systems analyst followed by executive positions in the computer and software industry eventually forming my own international management consulting and international business services integration organization. I am now an active portfolio investor and international business but retired. Hi Michael, thank you for sharing your story. 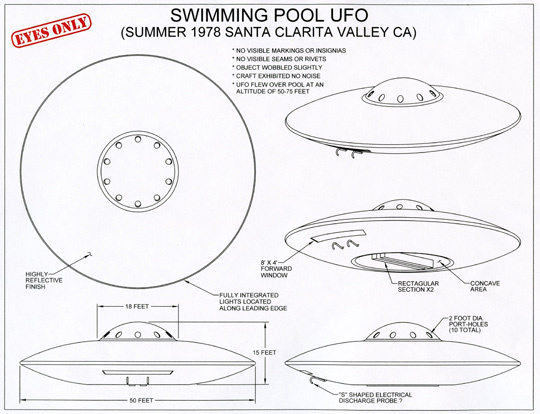 I came across tour story after I too saw a ufo in Santa Clarita back in 2016 early morning hours, and once more a couple months ago while walking my dog at 0430 in the morning. Both events were absolutely breath taking. If you reach out to me I will share those details with you.